Sarbus Sarfa brings everyone to the car station in Lloret right from the Barcelone el Prat Airport. Buses Sarbus Sarfa are fairly comfortable and have all the needed things: soft seats are good for relaxing; enough place for luggage, etc. ​When planning your trip, please consider that the carriers haven’t got night routes. If you are travelling from the Barcelona center, please, go to Barcelona Nord Bus Station (metro "Acr de Triomf") and take Sarbus Sarfa to LLoret de Mar bus station. 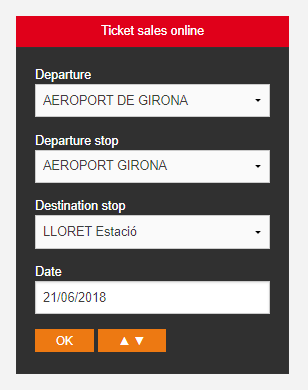 There is no direct train between Barcelona and Lloret de Mar, so you only can reach the destination making changes on the way. The train heads off from “Sants” train station located in the centre of Barcelona, and you have to get to this place from the airport first. Speeding trains work from the early morning till the night, yet they have no night routes. ​The whole time of the trip (including changes) is 2h 10m. Generally, the trip is pretty comfortable, still it's not a good match for those who are not good at following directions; who want to avoid exhausting transport changes; who travel with little children – they better choose another transportation option. Trip time 35 min. 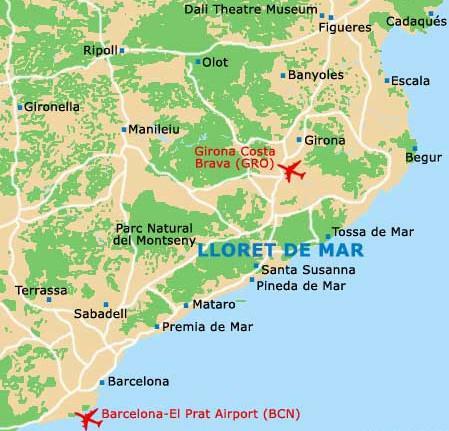 Regular and charter bus services link Lloret with Barcelona, Girona center or Girona airport and main European cities. There is an international coach terminal in Lloret and private terminals and parking areas around the town for coaches arriving from abroad.